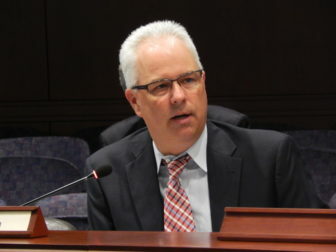 James Wadleigh, CEO of Connecticut’s health insurance exchange, Access Health CT, will step down from his post in April, Lt. Gov. Nancy Wyman announced Thursday. Wadleigh has worked at Access Health CT since 2012. He initially served as chief information officer and became the organization’s chief executive in 2015 after leading it on an interim basis for six months. “Jim has been a tireless advocate for an exchange that used every opportunity to educate and be available to consumers, to help them through the selection and enrollment process, and to ensure enrollees understand how to use their new insurance,” said Wyman, who chairs Access Health CT’s board. Wyman noted that more Connecticut residents signed up for health insurance plans sold on the exchange during the recent enrollment period than had the previous year, despite healthcare policy instability in Washington. Wyman praised Wadleigh’s focus on outreach and ensuring residents understood the benefits of having health insurance. Gov. Dannel P. Malloy echoed Wyman’s praise and commended Wadleigh for ensuring that the state’s health insurance exchange remains a national leader. “With President Trump and Republicans in Washington pulling no punches in their attacks on the Affordable Care Act … the work of Access Health CT has been both more difficult and more important than ever in the past year,” Malloy said. Wadleigh, whose base salary is $225,000, said it’s time for him to begin a new chapter in his life and he does not have a new job lined up, exchange spokeswoman Kathleen Tallarita said. Wadleigh said leaving had been a difficult decision, but “I know the Access Health CT team will continue to provide the value to the many individuals and families that need our services,” Wadleigh said.